Today we set an alarm. Best to beat the crowds at Versaille we have been told, and after learning yesterday that it is Spring Break in Fance we thought it was extra important to follow this advice. Liesel booked us the petit d’ejeuner at the F1 Trappes which I much appreciated as they include coffee! Yesterday was the first time in over a dozen years that I skipped my morning coffee, and although I survived the day, I was regretting the lack of caffeine by early evening. 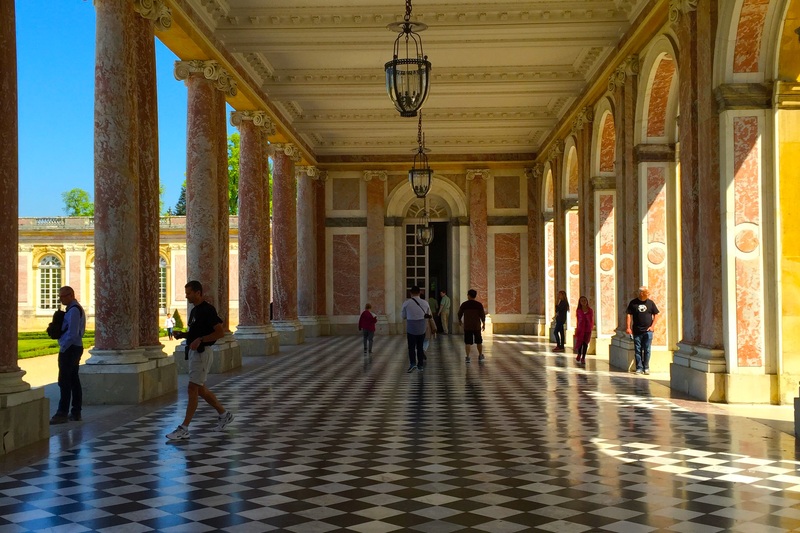 15 minutes from our Hotel sits the Palace of Versaille. We first spotted it driving down a small hill. It is amazing the transformation a city can take in a few hundred meters. Gone were the modern city malls and Renault dealerships to be replaced by blocks upon blocks of French apartments from another age. The GPS took us another 1.5 kilometres past the gates of Versailles in search of parking but we doubled back, deciding to chance our human navigation system to find us a more suitable lot. “Europe” parking lot would do well just a few hundred meters from the gates. I optimistically left my jacket in the trunk and we headed to the gates. We entered the queue shortly after 9:15. The crowd was starting to form and within 10 minutes of us taking our place in line, the number of people behind us was at least as many as in front. A trio of automatic rifle toting military guards slowly and deliberately patrolled the courtyard in strategic triangle formation, much to the surprise of the young woman from Toronto in front of us. It wasn’t that many weeks ago that terrorists had chosen this city as the venue for their deadly messages. We skipped through the ticket collection and security checkpoints and headed inside. A quick stop to grab a couple of the complimentary audioguides and we were in. What follows can not be described by words, despite the best pre-recorded attempts of the British man on the electronic device I carried. Halls upon halls and chambers upon chambers decorated for Kings and Queens. 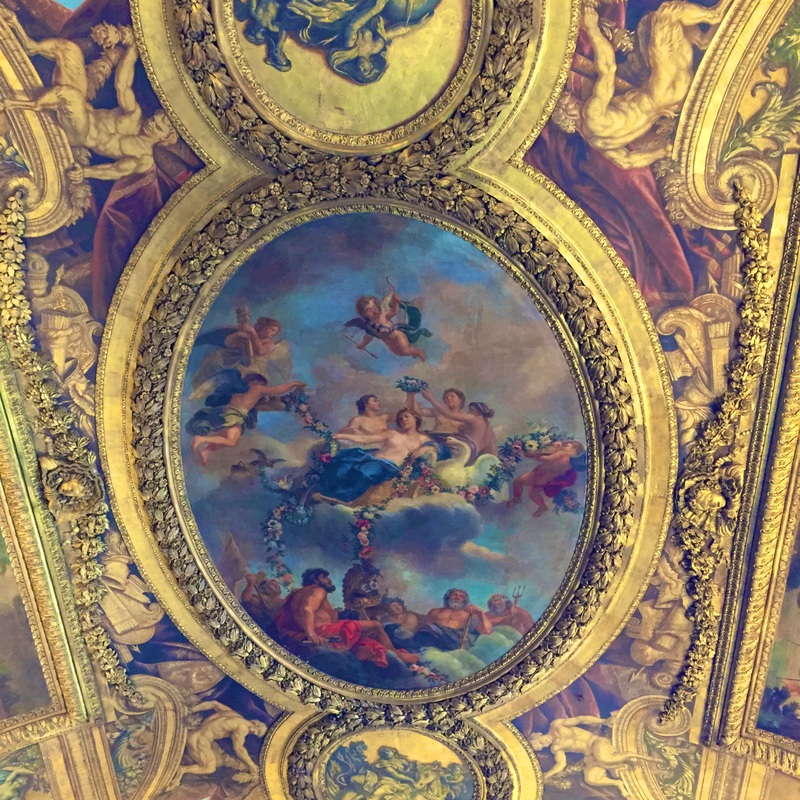 Although the Louvre now contains most of the “greatest” works of art from this Palace, there was no lack of 15 metre tall paintings to be amazed by. The ceiling in nearly every room contains colourful tributes to Royalty as expressed through mythological figures interacting with the earthly kingdoms. I found one painting particularly amusing as it depicts a noble riding a horse into battle while a cherub appears to be fixing his curly locks that have become disheveled from the conflict. The king’s bedchamber was also stunning as even the sheets have gold woven through their fabric. After a couple hours of staring up at depictions of half naked, in-bred, rich people it all starts to mind-numbingly blur together. Thankfully around this time we came to the end of the palace tour and it’s time to hit the gardens. “Gardens” do not do the grounds justice. Miles and miles of paths wind through tree mazes containing all sorts of secret fountains and sitting areas within them. In the centre of the grounds lies a massive man made lake in the shape of a cross. We see people in boats leisurely paddling their way from one end to the other and back again. We briefly contemplate hiring a canoe but decide we have too much to see and not enough time to see it so we continue on foot. A brief stop at the toilettes where I realize that the gender signs on the door frames are no more than a suggestion and we continue the path to the residence of Marie Antoinette. We’ve abandoned our audioguides back at the palace and my french reading skills and history knowledge are not what they should be but I can figure that Marie must have enjoyed living in luxury. It wasn’t enough to have beautiful palaces gifted to her, she also had her own majestic gardens constructed. A short walk from her domaine we find the most peculiar area on the grounds. An English village constructed in the late 18th century as if it were a Hollywood film set. 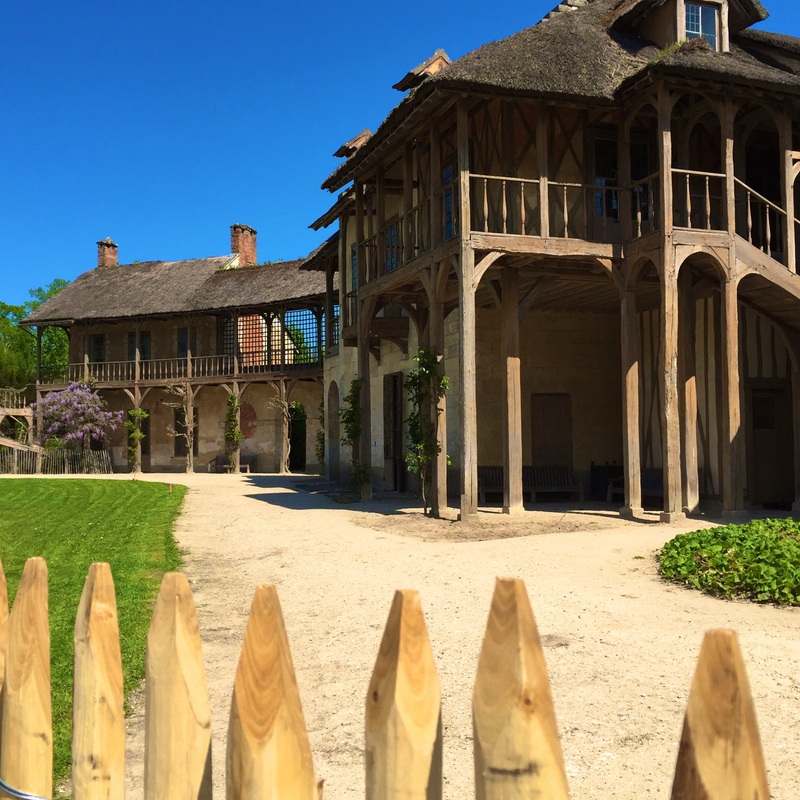 The guidebook tells us that Marie Antoinette had a fascination with the Brits and had it constructed along with a working farm to feel like she were in a small English town. They still have it fitted with all sorts of barnyard animals and vegetable gardens. The rest of Versaille is not visible from this retreat and if you woke up here unexpectedly you would have no idea you were a few minutes from Paris. All in all we spent the better part of 7 hours on our day in this spectacular display of opulence. As we made our way back to the palace we confirm to ourselves that it was definitely worth arriving early as the crowds had grown exponentially. We say goodbye to Versaille and head to our vehicle. Although I think I’ve paid the ticket to exit the parkade properly the gate does not open. There’s a button that I figure is the “call for help” button so I press it. After half a minute of busy signal I hear a crackly “Bonjour?” from the speaker. “Parlez-vous Anglais?” I plea. I hear a disgusted sigh from the other end of line and the gate lifts. Yay for not being bilingual! We’re back on the road to Beaune now as I type this. We bypassed Paris this time, seeing just a glimpse of the city in the distance. So many marvels so close yet they will have to wait for me until another time. Strange to think that just over that little hill lie the Eiffel tower and the Arc de Triomphe just barely out of sight. Back again after checking in at the Kyriad Beaune and heading into town. Free parking! A lot close to the centre of town had a spot at the end. We head to a highly recommended restaurant only to find Wednesday is the proprietor’s day of rest. I spot a pedestrian street close by where laughter can be heard so we follow the sound of clinking glasses past the boutique stores to a nearby square where we settle down at a table a couple feet away from the passing cars. The warm evening sun is setting directly behind Liesel, and shining right into my eyes. Eventually the waiter shows up to take our order. “Vin blanc de maison?” Liesel asks. “Non maison” the tall frenchman replies, immediately switching to English further elaborating on their absence of a house wine. He suggests a white wine suitable for “women” and the lady beside us nods her agreement. I ask for a suggestion of red and he suggests the Pommard. I ignorantly agree. The friendly woman beside us is happy to practice her English on us, and also translate for her German male companion. It’s their third trip to Beaune from Colmar where they reside. She’s quick to recommend a less “touristy” area of town for a meal and we gladly accept her help keying the location into Liesel’s phone. After we finish some typical small chat about where we are from, Chinese wedding traditions and snorkelers being eaten by sharks, we head off in search of fine French cuisine. 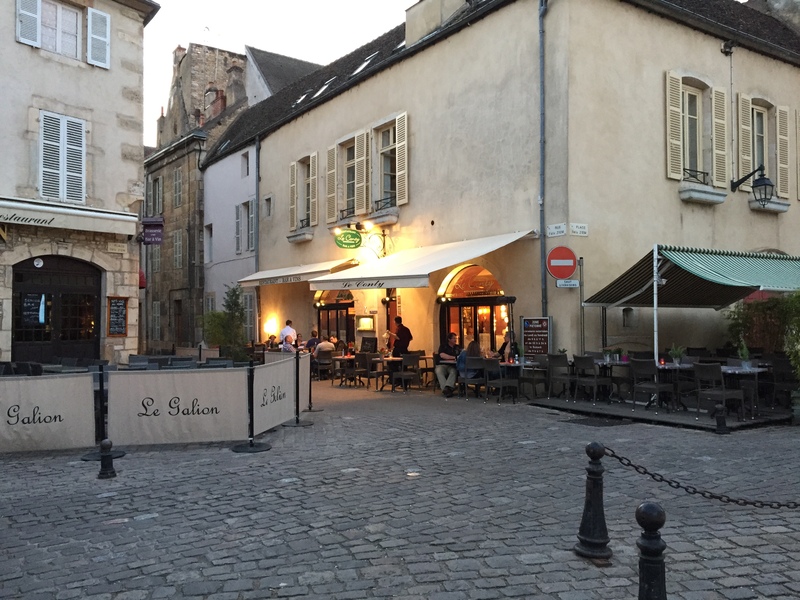 ‘Le Conty’ is tucked in the corner of a small plaza. We take the table beside a less than impressed couple trying to enjoy a quiet meal. Nearby, a group of self-important American business consultants discussing which of them is most overqualified for their current assignment sit drinking Pinot in comically oversized glasses. I briefly enjoy with them the feeling of superiority when I explain to my much more educated and knowledgeable sister what our main course of Tartare de Boeuf consists of. It’s our first real authentic meal since we’ve arrived in France and it does not disappoint. We head back to the hotel to unwind and catch the last half of the all Madrid quarterfinal of the Champion’s League on RTS Deux. This entry was posted in BRING A PASSPORT and tagged Beaune, France, travel, Versaille. Bookmark the permalink.